Join us for our annual tradition: TRB Aftershock! 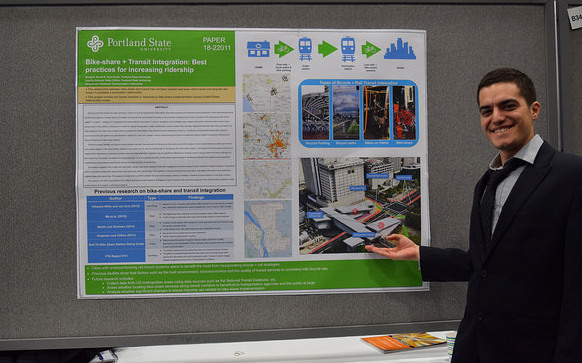 Portland State University students will presenting posters on the transportation research they brought to the TRB Annual Meeting this past Januaryin Washington D.C. — the largest gathering of transportation professionals in North America. Don't miss this exciting once-a-year event! Light refreshments and a cash bar will be provided. TREC at PSU is home to the National Institute for Transportation and Communities (NITC), the Initiative for Bicycle and Pedestrian Innovation (IBPI), and other transportation programs. TREC produces research and tools for transportation decision makers, develops K-12 curriculum to expand the diversity and capacity of the workforce, and engages students and young professionals through education. Join us for the 2018 TRB Aftershock event, sponsored by the Portland Chapter of Young Professionals in Transportation (YPT) and Portland State University's transportation student group, Students in Transportation Engineering and Planning (STEP)! Each January, Portland State graduate students travel to Washington, D.C., to present their research in front of a national audience at the annual meeting of the Transportation Research Board. The aftershock gathering, a PSU tradition, is a chance for fellow students to see the research they presented and hear about the conference. Refreshments will be provided, and student TRB posters will be on display. The National Institute for Transportation and Communities (NITC) and TransitCenter invites you to join us for our annual reception at the 97th Annual TRB Meeting for a night of networking, fun, and bingo made especially for you transportation wonks. And this time, we've bought out the whole bar (Fado Irish Pub)! We'll be running networking bingo (transportation style*), and handing out big and small prizes - provided by our research consortium of six universities (Portland State University, University of Oregon, Oregon Institute of Technology, University of Utah and new partners University of Arizona and University of Texas at Arlington), TransitCenter, and PeopleForBikes. *You might be wondering, "What does 'transportation style' mean?"